Stamp a Sweet Impression: TEBB Challenge #2 Hosted by Karen M.
TEBB Challenge #2 Hosted by Karen M.
Welcome to Challenge #2 for the Taylored Expressions Birthday Bash! There are lots of fun challenges and fabulous prizes to celebrate Cuppie's 1st Birthday! We hope you'll play along in as many challenges as you can. Did you already start working on Taylor's challenge? Isn't her inspiration piece just yummy! A new challenge will be posted each hour by our fabulous Baker's Dozen design team. We'll have a variety of challenges including sketch, technique, colour and inspiration. You'll have 5 days to complete these challenges and be eligible for the prizes. My challenge is the first sketch challenge of the day and I've kept it clean and simple. CHALLENGE: Create a card, scrapbook page or 3D item using the sketch. You're not required to use Taylored Expressions images for our challenges. KEYWORD: Upload your creation to your blog or online gallery (or both). 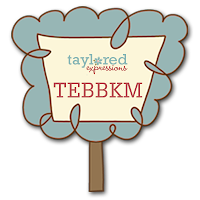 If you're uploading to online galleries, use the keyword TEBBKM. Then come back to this challenge and leave a comment with a direct link to your creation! In order to be eligible for the prizes, you must leave a comment with a link to your card by midnight PST Wednesday, September 9th. PRIZE: I will choose my favourite creation from among all the participants and mail you the card I created for this challenge along with a $10.00 gift certificate to the TE Store! 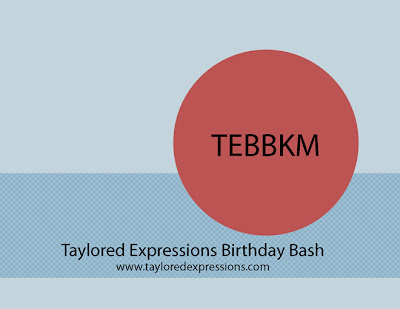 GRAND PRIZE: One random person who participates in ALL 13 of our Birthday Bash challenges will receive a $50.00 gift certificate to the TE Store in addition to an 8x10 custom watercolour Cuppie painting by our very own Jessie Oleson! Click here to check out all of Jessie's adorable artwork at her Etsy Shop. Once you complete and link all 12 challenges, send an email to tayloredexpressions@gmail.com to be eligible for our grand prize. Just include your name and "I completed all 13 challenges". Here's the sample I created using Branching Out and Branching Out Coordinates. I stuck with the simple layout but added plenty of detail and texture. The image is stamped with Memento Tuxedo Black onto Choice Buttercream. The tire is paper pieced, the branch is covered with Espresso Dimensional Pearls, the leaves are popped for dimension and I added a swipe of Green Apple Smooch to each one after colouring them with copics. I pleated some paper and stitched the pleats down so they'd lie flat then added some ribbon. Lastly I added some Multicolour Twinkles for a little sparkle. Thanks so much for playing along! I can't wait to see what you bake up with the sketch! Don't forget to check back every hour for a day full of the fun challenges! Accessories: copics, circle Nestabilities, Espresso Dimensional Pearls, Green Apple Smooch, Multicolour Twinkles, foam tape, ribbon, sewing, scallop border punch. I dont know if Im just hungry or if anyone else is thinking it, but the branch almost looks like chocolate! Mmmmmmmmmm!! lol Very cute, love the simple sketch. oh I love your card, Karen!! I made a card using your sketch I will upload later! it was FUN! what a sweet card!! Happy Birthday to you Cuppie!!! One down, 12 to go - EEEK! LOVE this Karen! I played too!! Fabulous sketch! I gave it a try for a clean & simple card. OH! Such a cute card & a great sketch!!! here is my card! I like this sketch! Here's my card, which I combined with Charmaine's color challenge. Thanks! Thanks for the wonderful sketch Karen!! I decided to make a scrapbook page with it! This sketch is just too cute! I love the sample you made for this one too! Great job hosting! Thanks for the great sketch; the challenges were so much fun!! Here is mine combined with Jodi's colors! COOOL sketch, thanks so much! Love your card, I love that set! Great card!! Love this sketch! Here's my card: HERE'S my card! thanks for a great sketch, and the fun! Fun sketch! Here is mine. Loved the sketch Karen. I will be using this many times over. Your card is so beautiful as well. I have included a link to my card. Sketch challenges are my favorite - thanks for the fun sketch Karen! thanks for a fun and cute sketch.. I just found your site last week.. and the stamps are so cute..I dont have any yet..but I hope to soon. Ok maybe this is my card.